This recipe has been borrowed from my mother in law (again..yeah). You know what they say “ The way to your husband’s heart is to learn how his mother cooks” 😉 LOL. My mother in law is a very good cook and whenever she visits us I make the most of it by learning what I can. What I find cool is the way she cuts the bhindi. 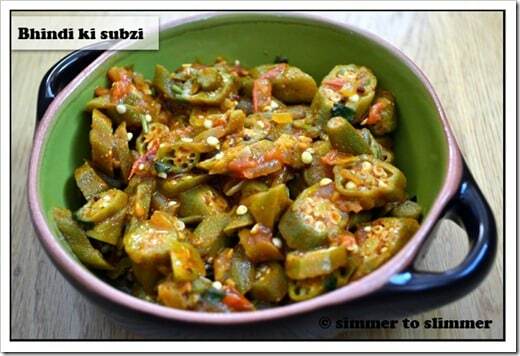 If you look closely the bhindi is cut with a slant and that gives it an interesting touch. As usual, the recipe is simple to make and you can also substitute the cumin, coriander powder with the Mangalorean Masala which I do on and off to get a slight variation of taste. This 30-minute recipe to make Okra is a keeper. It is delicious and easy to make and it goes well with roti or dal and rice. 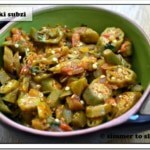 Wash the bhindi/okra and pat dry them with a towel. Cut the bhindi to the desired size. Heat the oil in a medium sized pan on medium heat and add mustard seeds to it. When they start spluttering add kadipatta to it. Let it fry for around 20 seconds and then add onions and fry them till they are translucent. Add tomatoes and fry them till they are mushy. 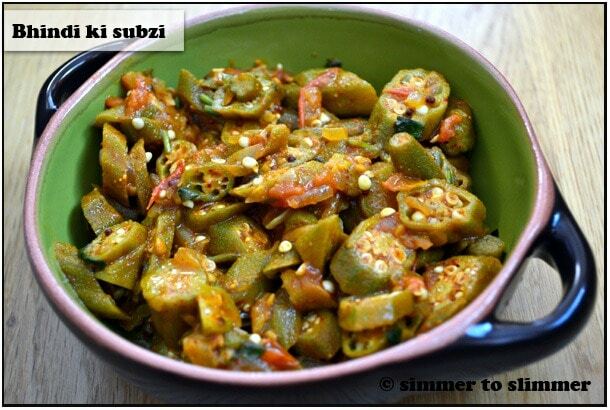 Add bhindi along with chili powder, salt, coriander, turmeric, and cumin powder and mix well. [If it gets sticky, keep stirring it till the thread like sticky substance disappears]. Lower the heat and cover the pan and let the okra cook till done(should take approximately 10 minutes).